Gone but not forgotten, this Grateful Dead T-Shirt pays tribute to Grateful Dead keyboardist, Brent Mydland. 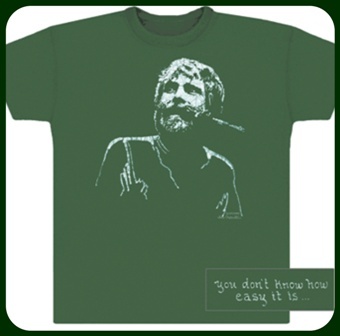 It has a batik style image of Brent on the front, and the back of the t-shirt has the words "you don't know how easy it is...". Screen printed on a heather green 4 1/2 oz. combed ring spun cotton, super soft style T-shirt. Officially licensed by the Grateful Dead, and the estate of Brent Mydland.